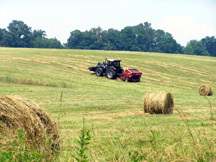 Montgomery County is home to a surprising number of rural areas. The forward-thinking 1964 General Plan focused growth in defined corridors emanating from the population centers in and around the Capital Beltway. Between those corridors, the General Plan called for wedges of low-density residential uses, open space and protected farmland. The rural areas encompass the 93,000 acre Agricultural Reserve along with the larger rural communities of Damascus and Poolesville; small crossroad communities such as Beallsville, Sunshine and Dickerson; and areas with mixed open land and housing. In 1980, the Montgomery County Council made one of the most significant land-use decisions in county history by creating what we call the Agricultural Reserve. Heralded as one of the best examples of land conservation policies in the country, the Agricultural Reserve encompasses 93,000 acres – almost a third of the county’s land resources – along the county’s northern, western, and eastern borders. The Agricultural Reserve and its accompanying Master Plan and zoning elements were designed to protect farmland and agriculture. Along with a sustained commitment to agriculture through the county’s Office of Agriculture, the combination of tools helps retain more than 500 farms that contribute millions of dollars to Montgomery County’s annual economy. This is a notable achievement in an area so close to the nation’s capital, where development pressure remains perpetual and intense. Established by law in 2008, the Building Lot Termination Program (BLT) is a farmland preservation tool. A BLT easement restricts residential, commercial, industrial and other non-agricultural uses on a given property. The primary purpose of a BLT easement is to preserve agricultural land by reducing the fragmentation of farmland resulting from residential development. Creating a BLT easement can provide additional compensation to a landowner who can demonstrate that his or her land is capable of residential development and agrees to forgo that development and terminate the approved waste disposal system associated with the lot. Learn more about the Building Lot Termination Program. How Can Residents Enjoy the Agricultural Reserve? Although primarily a working agricultural landscape, the Agricultural Reserve offers county residents a plethora of activities. Check out the Reserve’s many opportunities — pick-your-own fruit farms, a winery, bike routes and pastoral scenic vistas — in a resource guide and map, produced in collaboration with the Montgomery Countryside Alliance. Beyond that, the Reserve represents a historic landscape as well as a resource that protects our public water supply and provides access to green open spaces. For more information on agricultural preservation programs, farmers markets, and the Cooperative Extension Service, visit Montgomery County’s Office of Agriculture. How does the Agricultural Reserve protect farmland? In 1980, after determining that there was a critical need to protect productive farmland in Montgomery County, the County Council and Planning Board adopted a Master Plan accompanied by a series of land use regulations and incentives designed to minimize inappropriate development, avoid the fragmentation of farmland by subdivision, strengthen agriculture and channel growth to down- county growth areas through rezoning with a transfer of development rights program. A zoning district created for the primary agricultural preservation areas within the Agricultural Reserve, with agriculture and related activities as its preferred uses. Residential development is limited to no more than one dwelling unit per 25 acres, although individual lots can be as small as one acre. The two other primary zoning districts within the Agricultural Reserve, the rural and rural cluster zones, are used in areas featuring a mix of farmland, open space and low-density housing. Residential development is limited to no more than one dwelling unit per 5 acres. In the rural cluster zone, individual lots can be as small as one acre. This is the primary mechanism to provide equity compensation to landowners in the RDT zone. TDR transfers residential development potential from the farmland preservation areas of the Agricultural Reserve into areas designated as better suited for growth. Also see the Preservation of Agriculture & Rural Open Space master plan.